One of the most notable developments in the La Porte Community School Corporation for the 2018-2019 school year has been that of the Performing Arts Center at the high school. 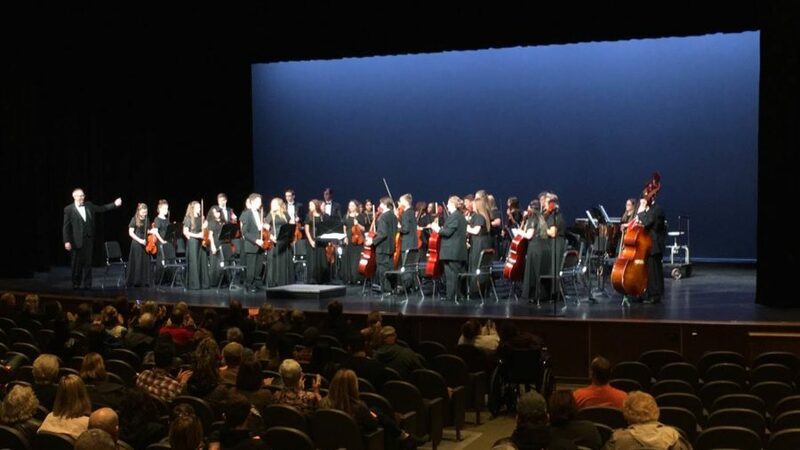 As of this article, there have been performances by the band, orchestra, choir, and musical theater group. Each director stated that their performances have been improved by the PAC and that it is a welcome addition to the arts at LPHS. One of the most important improvements the PAC has made to performances at LPHS is the quality of the acoustics. “The overall acoustics are so much better in the PAC. The orchestras have had two concerts in the new space already. Students can hear each other much more easily while they are playing, which helps balance and blend a lot. We are fortunate to have such a state-of-the-art facility,” Pete Collins, Orchestra director, said. The capacity for onstage presence of performers in the PAC is another notable improvement over the old auditorium. “The lighting is greatly improved, as well. The larger stage area had an impact on our recent Holiday Concert. We were able to have the grand piano positioned closer to the percussion and bass sections,” Collins said. The new and improved instruments not only benefit performers but those backstage and managing the space as well. “The technological improvements have made lighting the stage much easier. The sound system has made the amplification of events much better also. The facility has outstanding acoustics, so microphones are used for sound support, not sound source. The extra space in the wings and the use of new dressing rooms facilitate large performance groups much better,” Richard Snyder, PAC director, said. A massive improvement of the PAC over the old auditorium is the technical capabilities. With all-new sound and lighting systems, as well as a performance-centered infrastructure, the PAC is a wonderful environment for students to perform and grow. “The goal is to have a large group of students who, at least, explore Theatre Arts/Dance. Classes will explore acting, technical theatre, lighting design, sound design, ballet, modern dance, and choreography. The more students involved, the more ambitious the creative team in the PAC will become,” Snyder said. Even with the already heightened sense of quality, there is still room for improvement and refinement, both on and off stage. “As we develop better ways of using the technology and logistic improvements, I can see how our performances will have a much different, more professional feel to them,” Thomas Coe, Choir director, said. With even more events coming up soon, such as the band program’s recital night Thursday, performances in the PAC are soaring to new heights.